Rotherham manager Paul Warne thought his side were robbed of a couple of penalties that would have led to a ‘deserved’ three points against Wigan Athletic. The Millers took the lead through Clark Robertson just after the midway point in the first half, although Josh Windass equalised shortly after. 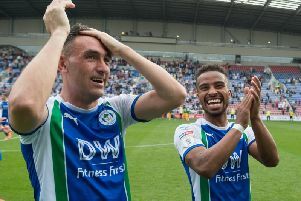 Latics then had to withstand an onslaught from the home side, who lie fourth-bottom in the Championship standings, which included a couple of loud shouts for a spot-kick. But honours ended even which preserved the six-point buffer between the two sides. “I thought we were excellent, first half I thought we should have come in at half time up,” assessed Warne. “They scored with a great finish, but we should have stopped it at source. “I thought we did enough to be 2-0 up at half time, really. “At this level you have to take your chances and we didn’t really take our chances. “The game was lacking chances really and if I’m honest, I thought the last five or 10 minutes it looked more like they would score. “I’m obviously biased but I thought we had really good claims on a couple of pens – on another day you might get them. “The Woody one he pulled his shirt so I’m disappointed on that, but I’m not disappointed with what the team gives me. Rotherham also squandered a gilt-edged opportunity to win the game when striker Michael Smith volleyed miles over the bar from bang in front. “It’s a good chance to score,” Warne acknowledged. “As a centre-forward you fancy it and, more often than not, Smudge would rip the net off. “But it wasn’t to be. Robbo got a good goal and all our set-pieces we would have had enough to win it. “I’m not really a stat man but they’re all in our ascendency. “Second-half, we weren’t as good and we weren’t as effective. “I always have a massive belief when we’re shooting that way that ‘this is it’ and we’re going to score, but today it just didn’t fall. “I thought today was a good opportunity to win a football match. “I showed the lads all the fixtures today and I felt it would be the day we got three points. “It’s disappointing we didn’t take the three points.